PDF3D from Visual Technology Services is used with IronCAD for interactive 3D parts list and assembly documents in Fronema's I-XPro4D. The IronCAD Gold Partner Fronema S.r.l. 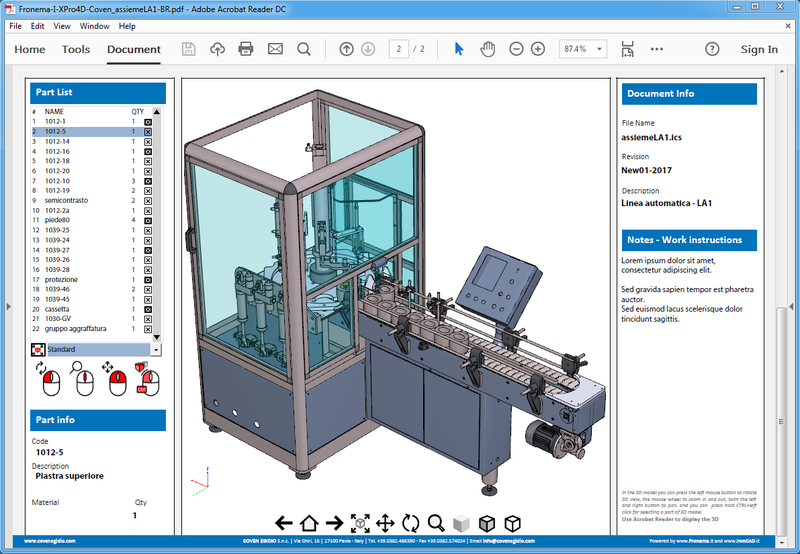 has extended the IronCAD 3D design software with I-XPro4D to produce rich interactive spare-parts list navigation, bill-of-materials (BOM) and repair assembly documentation using PDF3D. Fronema is the primary IronCAD commercial partner covering Italy and offers services and extended solutions including I-XPro4D for 3D PDF publishing, using the PDF3D SDK Pro software development toolkit. The I-XPro4D IronCAD-based solution includes an easy to use visual report layout editor for placing key elements on the page, with custom style and branding for each client. The 3D PDF interactive views, parts list, view carousel and part data are generated by I-XPro4D directly from the master 3D project files. This is achieved by directly integrating the IronCAD programming and automation services with the PDF3D SDK Pro API in a single new bespoke application. The I-XPro4D is released and available from Fronema (http://ironcad.it/prodotti/i-xpro4d), while the PDF3D SDK Pro toolkit is available under license for integration by PDF3D. Fronema (http://www.ironcad.it) is the IronCAD gold partner for Italy, with deep expertise in Computer Aided Design (CAD) software solutions, and is a well-established supplier of 3D CAD solutions and technologies in a highly specialized and highly technical sector. The distinct focus of the company is specializing in solutions to local client requirements, and researching and integrating new technologies in a constantly evolving market, while applying practical business reality - providing an impeccable and responsive service. PDF3D (http://www.pdf3d.com) produce a suite of widely respected software products and plugins for engineers, scientists and developers who need to communicate complex data and 3D models to others in the universally accessible PDF format. PDF3D’s technology provides the fastest and easiest-to-use, highly compressed 3D PDF conversion available for an ever-increasing range of formats and tools. From 3D CAD to GIS, DWG and LIDAR, PDF3D works closely with users and programmers within the engineering, geospatial, geology, aerospace, architecture, medical and product packaging communities worldwide.